The first computer I bought was a pc. I was this close to throwing it out the window, it was so maddeningly difficult to use. Learning how to do anything on that computer, even the simplest things, was an ordeal. It was never fun. I hated computers. Not long after I sat down at a Macintosh SE in the computer lab at NYU to learn how to make animations. In about a minute I had objects moving around the screen. To this day I remember just what I was feeling, I was having that much fun. From then on everything changed for me. I loved computers. I bought a Macintosh SE and I’ve been a Mac person ever since. I think that was 1987. I still have that Macintosh SE. How could I get rid of something that changed my life the way it it did?? I turned it on just now and that ding sound it makes made my heart skip a beat, just the way it always did. It’s like a pavlovian bell signaling imminent fun. But it wouldn’t boot up. The last time I turned it on, it did. But today it has that face you see above. I wonder if there’s any way to get it repaired? According to that article, it appears to be a “RAM test failure,” and recommends trying to boot from a floppy. 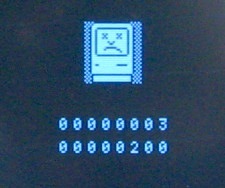 Kind of fitting that today of all days, you would get a sad mac icon. I read comments on the CBC site last night and one of them said: “iSad”. I inherited a Mac SE from a relative back in the very late 80s and have been a Mac devotee ever since (the two old retired iMacs in my closet attest to that, as well as this present one, my iBook and iPhone and iPod). All of the tributes to Steve Jobs and his vision pouring in attest to his influence. After all of the years spent struggling with counter-intuitive MS computers at work, it was a treat coming home and having fun, and really learning things, with the creations he shepherded. He’s left a wonderful and important legacy. Stacy, you know I’ve been a cheapy, nerdy, pc user- since prehistoric-cyber times, but I appreciate your post today, it’s so delicately poetic. I remember that conference where you participated with Jobs and Gates about the future of the internet in the late eighties(?). And I was thinking about how you must feel about his seemingly “sudden” death. Macs will survive, but things won’t be the same. Your post highlights such an interesting (phoney) dichotomy, play vs utility. I wonder where I can find a floppy to try to book my SE?? Chris, I don’t know if Jobs or Gates were at that conference. I don’t remember. But people who worked for them were. I think I was approached by Microsoft shortly after. Or was it before. See? No memory. Steve Jobs said, “Wait a minute here…” – and that’s why he’s called a visionary. 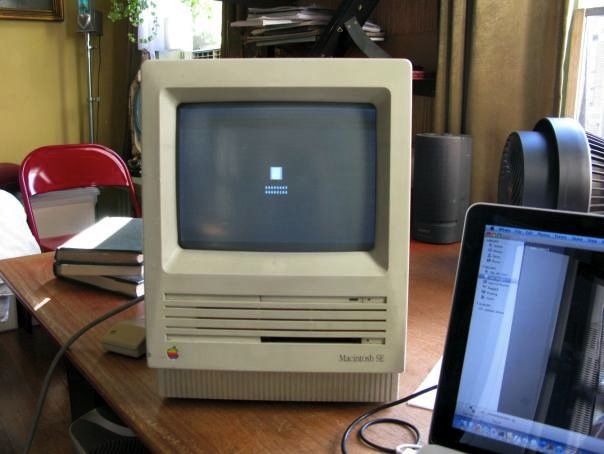 I got the Mac Classic in 1985. My world would never be the same again.